Winter Classic: New Year, Old Rivalry! Join us this Boxing Day as Manchester Storm face the Glasgow Clan, 26th December, 17:30PM face-off. Your Go Goodwins Manchester Storm are excited to announce special themed jerseys for the New Year’s Day game against Sheffield Steelers, 1st January 2019 – 17:30 face-off! The theme for this New Year, old rivalry game is the “Winter Classic”. In this year’s Winter Classic, Storm will be icing in a special retro-themed shirt to mark Manchester’s rich hockey heritage, and the first ‘War of the Roses’ fixture played between hockey clubs from Lancashire and Yorkshire at the Ice Palace Manchester in March 1911. This inaugural Roses contest resulted in a Manchester side heavily defeating the Yorkshire Skating Club 14-0. Hockey had been played in the city since the opening of the Ice Palace at Cheetham Hill in December 1910. At that time the rink had a capacity of 2000 and was the largest in Britain. The city’s first hockey club was quickly established and was known simply as Manchester – later becoming the Manchester Rapids when the four time French champions Rapides de Paris relocated to the city from Paris in the 1930s. The Ice Palace subsequently hosted the Manchester club and competitive hockey for a further thirty years, with the final fixture seeing Manchester defeat local rivals Liverpool 3-2 in February 1940. There would be no further hockey played in Manchester until the Altrincham Aces were formed in 1961. Sheffield Steelers currently sit just three points ahead of the Storm in the EIHL table. The last few so be sure to expect a hard-fought game as Storm look to steal two points on home ice. 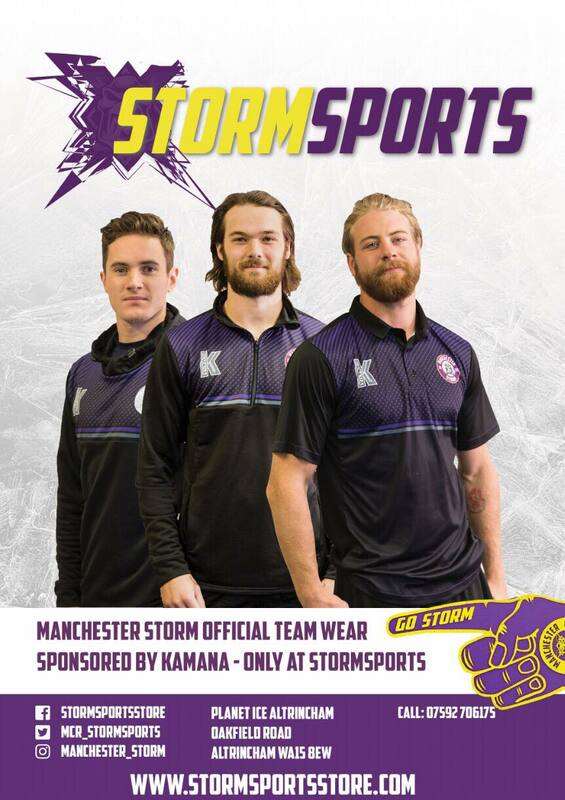 “The Manchester Storm are proud of the heritage of Manchester hockey & as we look to building our future as a club, we wanted to dedicate one of the biggest games of the year to look back on it’s rich history”. We look forward to the annual New Year’s game and hope to see you all there. What better way to start the New Year with some Ice hockey? The last few New Year’s games against Steelers have been a sell out, so let’s pack the shelter! The Club are delighted to announce the second Skate with the Storm event on Wednesday 2nd January, 9:15-10am! This will give fans the chance to get signatures and photos with the players. There will be a professional photographer on the ice taking photos throughout the event and the cafe will be open for those wanting hot drinks. Skate hire is just £2.50 from Planet Ice! Whether you’re off work while the kids are off school, or just want something different to do, come along to the Storm Shelter and skate with your favourite players. Everyone is welcome. If you can’t make it then don’t be too disappointed, as the club and the OSC will be hosting plenty of special events across 2019! To book tickets to our Boxing Day clash & the annual New Years Day rivalry match, visit our website NOW or call the Planet Ice Box Office on 0161 926 8782! MATCH PREVIEW: Storm Face Clan in Boxing Day Game!